What is a Power and Free Conveyor? 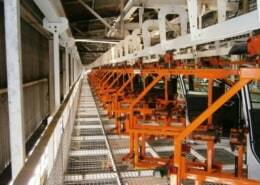 Power and free conveyors are the workhorse of the overhead conveyor product family. 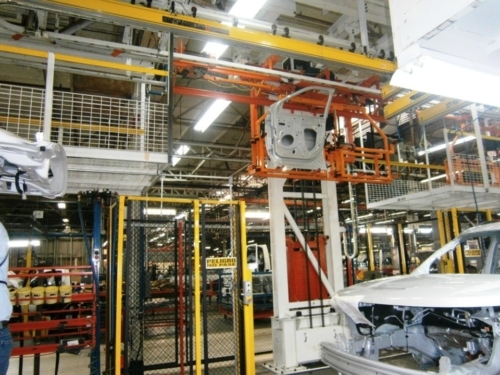 Power and free conveyors are typically used to transport parts along an assembly line from one process to another. Power and Free conveyors also enable product to buffer along the conveyor path. 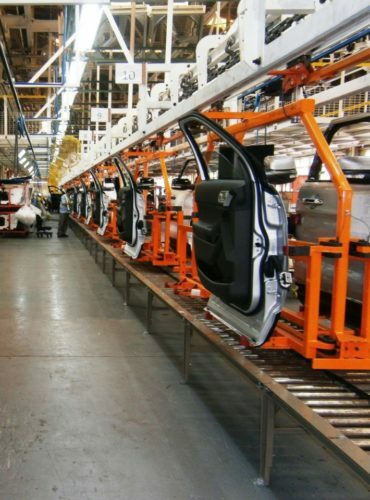 They are extremely versatile because they allow parts to stop and start automatically as required. How do Power and Free Conveyors Work? Power and Free conveyors have two tracks, with one track located above the other. On one track which is known as the “power” track, a rivetless conveyor chain is attached. 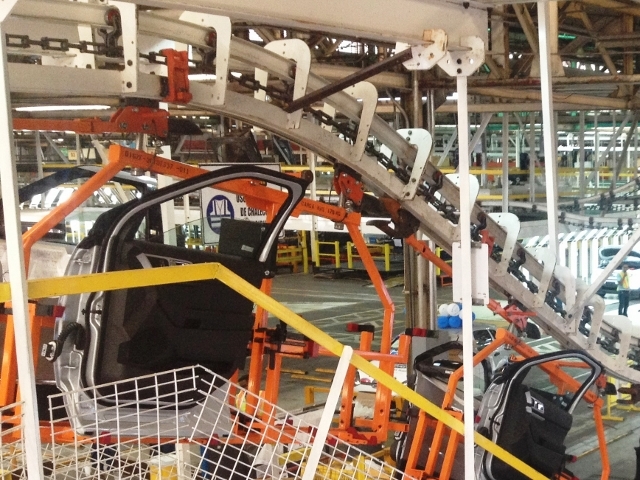 This conveyor runs continuously when the overhead conveyor is in operation. On the second track, the loads that the conveyor will carry are attached to the conveyor system via load bars and trolleys. This second track is known as the “free track” of the conveyor. Small mechanical devices called “pusher dogs” are located at regular increments along the moving chain. The purpose of the pusher dog is to push the free trolleys along the conveyor track. Provided the track in front is free from either other trolleys or mechanical stop locations, the free trolleys are pushed along by the pusher dog at the same speed as the power chain. When a trolley comes up against another carrier in front, the free trolley system automatically disengages the trolley. This allows the power chain to continue running. In this way, the free trolleys can stop and start at various points within the conveyor system. The loads on the conveyor can also accumulate (i.e. bunch together) when necessary, or alternatively, they can be separated to travel one by one by means of a pneumatically operated stop which stops the free trolleys. Power and Free conveyors are generally considered to be part of the family of overhead conveyor systems. 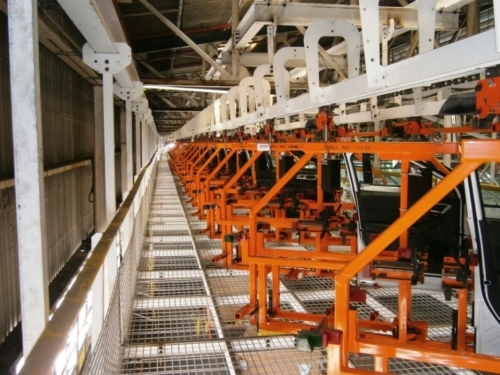 The most basic overhead conveyor system is the hand push trolley system (with a trolley on an I-beam or enclosed track). 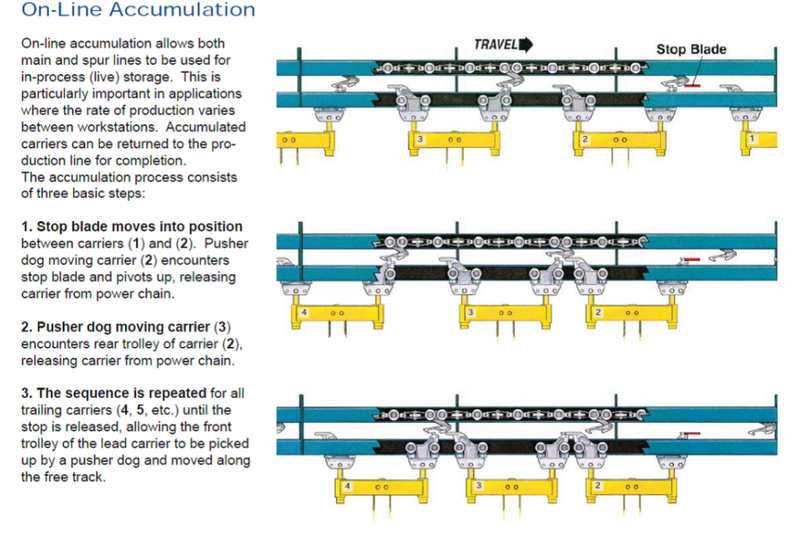 When a motor and chain is added to the system, these conveyors can move continuously or stop/start (indexing mode) with the parts moving along with the chain. 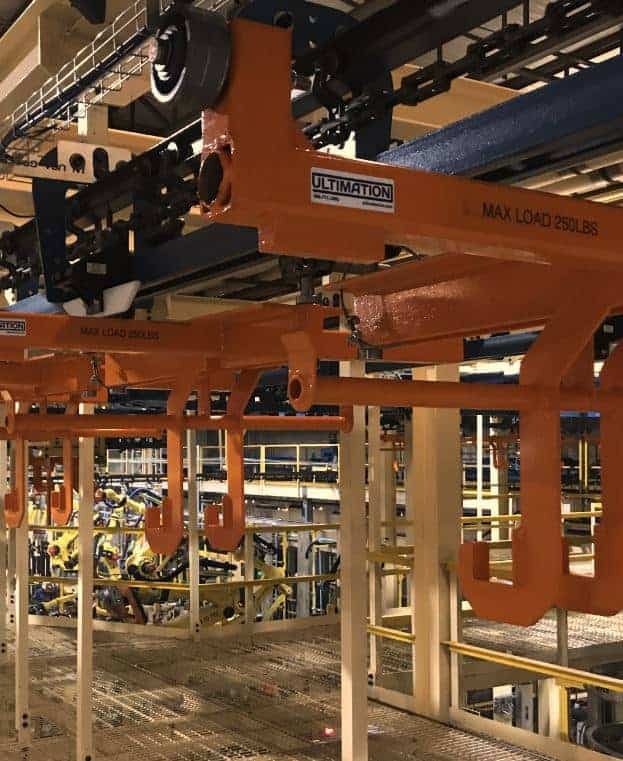 Finally, Power and Free conveyor systems are the most useful of the overhead conveyor family as the loads can engage and disengage with the moving chain. Although we think of them as being in the overhead conveyor group, power and free conveyors can also be used when mounted to the factor floor. In this case, they are known as inverted power and free conveyors. Webb’s exclusive Wide Wing™ design trolleys, and lug channel track provide smoother conveyor to conveyor transfers, increased load stability, and the strongest track section available on the market. Load capacities range up to 20,000 lbs. individual unit loads. 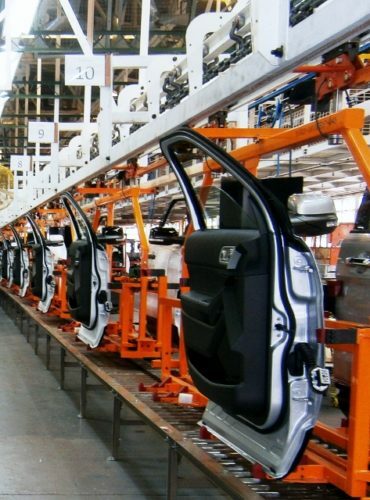 What are the Advantages of Power and Free Conveyor Systems? 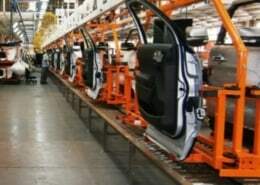 Because Power and Free Conveyors combine many of the advantages of other conveyor types and conveyor systems with relatively few disadvantages, they have long been the first choice for the automotive industry and other industries where high volume, durability and high reliability are very important. 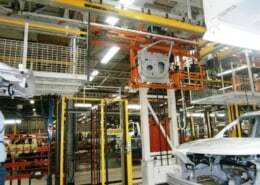 Compared with other overhead conveyor technologies, power and free systems generally have far fewer motors and far fewer moving parts that can go wrong. Electrical systems for power and free conveyors are typically much simpler than for friction conveyors or for electrified monorail systems. Simple pneumatic devices (air cylinders) can be located along the line at any location where carriers need to be stopped and then released when ready to move again. These pneumatic stops can be relocated fairly easily as required if the customer’s needs change. 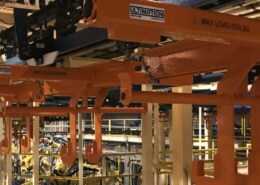 The Webb “Dog-Magic” system which allows trolleys to accumulate and the disengage provides a mechanical intelligence un-matched by many other conveyor types. Power and Free Conveyors are routinely used in harsh environments, including paint ovens, above dip tanks and throughout paint pre-treatment facilities. Where necessary, special shrouding and carrier design can be used to prevent any drips from the chain from landing on the product. For food safe power and free conveyor systems, Ultimation and Webb’s overhead conveyor systems may be used in food-safe environments with appropriate component and lubrication selection. This includes conveyors utilizing H1 category food safe lubricants. Need help learning about other conveyor types, which types to use and how to specify them? This step by step guide will help.